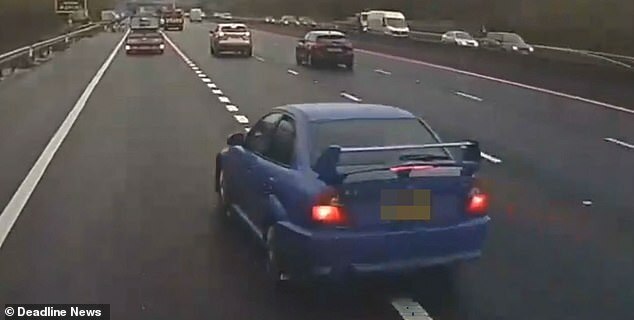 This is the shocking moment an angry Mitsubishi driver swerves in front of a HGV and repeatedly brake-checks on a motorway. The video, filmed on the M27 near Southampton, captures the motorist as he attempts to join the motorway from a service station slip road. But the HGV driver, Simon Northcliffe, said he couldn’t move to let the motorist in due to a car in the lane next to him – causing a dramatic road rage meltdown. 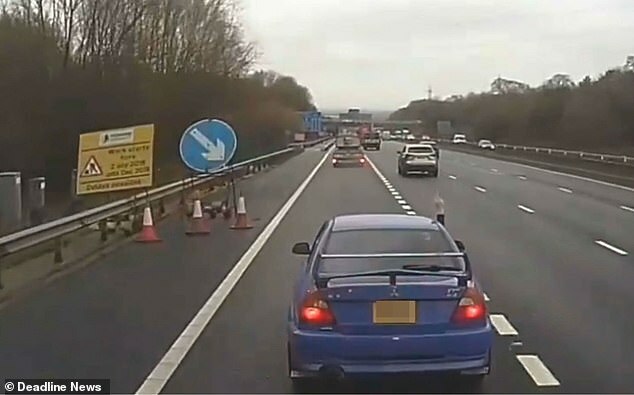 The motorist, who drives a blue Mitsubishi Lancer Evolution, swerves in front of Mr Northcliffe’s lorry and brake-checks while flipping the finger. In the clip, the enraged driver even sticks his head out of the window and looks directly at Mr Northcliffe while making an obscene gesture. He repeats this several times on the motorway before driving away and out of sight of the HGV. Mr Northcliffe, from Dudley in the West Midlands, recorded the incident on his dashcam on Wednesday and posted the clip to social media. He said: ‘This happened to me yesterday on the M27 just passing Rownhams services heading towards Southampton dock. 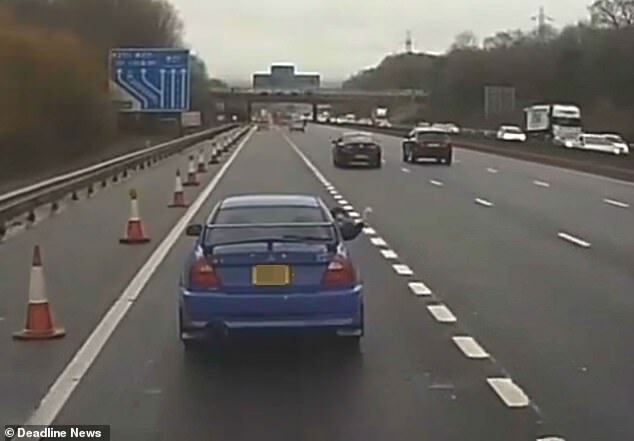 ‘As you can see the blue Evo was on the slip road to exit the services however I couldn’t move over as I had a car alongside me. ‘He decided to brake check me because I didn’t push the other car out the way. Many viewers took to social media to comment on the shocking road rage incident. Another added: ‘Should have given the p**** a nudge up the a*** and off the road, some really bad driving. Mr Northcliffe said: ‘It happens on a regular basis. He was on the slip road trying to come out of the services.